In September, I was at a workshop in Seattle sponsored by the Puget Sound Beekeepers Association. The featured presenter, Michael Bush, said bees are pretty smart and know how to take care of themselves better than we do. That makes sense. He also said if you’re not sure what to do, the best thing to do is nothing. If you’re unsure, you might do more harm than good. I remembered that about an hour after checking out my hive today. Earlier in the day, we had been having a discussion on the Portland Urban Beekeepers Facebook page about all the dead bees around our hives. That’s when I learned I wasn’t a complete failure with my second hive and that dead bees after a cold spell are normal. Portland being on the western side of the Cascade mountains is much warmer than east of the Cascades where I am. 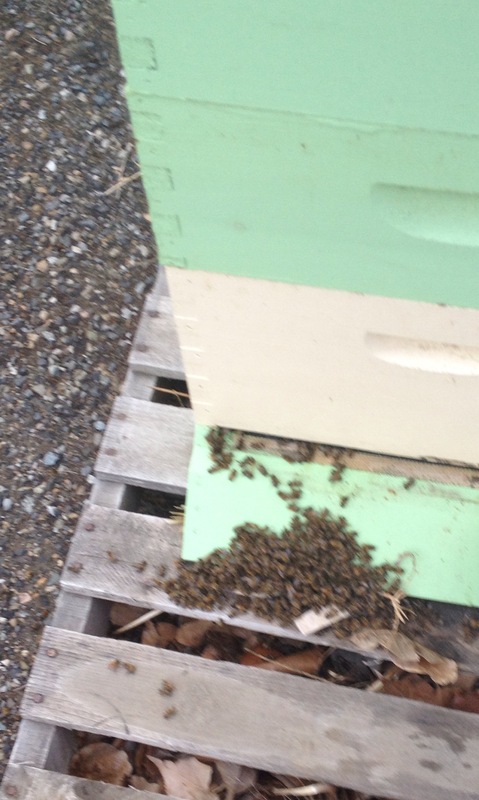 They have actually been having reasonable weather and can check their hives. Here, it got up to about 37 today and is about 30 now. I had dead bees around my hive before Thanksgiving but haven’t been able to open it up because the temperature has been too low. It got down to 5 degrees right after Thanksgiving. Today, I went to take a look. There were a couple of dead bees blocking the entrance. I thought I’d remove them and discovered a lot more in there, too. So, I removed the entrance reducer and used a metal wire to scoop out the dead bees from the bottom of the entrance. There were a lot of them…hundreds. A few bees left the hive immediately and a few more later. It was clear I had stirred them up because I heard a buzzing start. This was music to my ears. I thought maybe the original pile of dead bees outside the hive signaled another failure. I guess I’ll figure it out, but if anyone has any thoughts, I’d love to hear them.